PORTLAND, Ore. - Feb. 15, 2019 - PRLog -- Chumaround.com (Chumaround) announced today that world renowned strongman Titano Oddfellow has signed up to be a local host in Portland and is ready to show visitors that "There's adventure everywhere!" Titano writes, "I am a world known circus and sideshow strongman, sword swallower and actor as well as comedian. I've been on several TV shows, magazine interviews including Men's Health magazine. I was a featured performer at the Metropolitan Opera and was lucky enough to be the first face tattooed person to ever perform on its stage! More importantly, I have always been a lover of life, meeting new people and sharing my fun energy while looking for the adventure that can lie around the next corner." "Let's face it, cookie-cutter tours that herd travelers from place to place are boring," says founder Michael Cruz. "People that visit cities want more. They want unscripted experiences. They want to meet locals, make authentic connections and do things that truly interest them. I think Titano will be a great host, and I'm certain hist guests will have amazing adventures and stories to share with their friends and family. And what might a guest, family, or group expect when they book a chum around with Titano? He writes, "I specialize in all the things you'd want to see i Portland; from scenic walks around the city to up close views of the beautiful crows that grace this amazing city. I can take you on amazing hikes within the city limits. We can go to local shows, clubs, restaurants and I'd also love to show you some really bizarre and fun off the beaten path local places. There is adventure around every corner. Also, you can have the option of going on an adventure with my beautiful husky dog sidekick if wanted—he's wonderful company!" 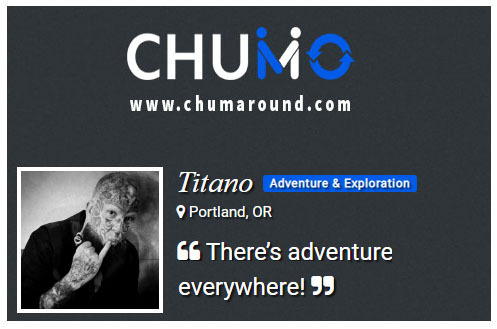 You can now contact, book and have a amazing adventure in Portland with Titano by visiting his host page on Chumaround.com.